One of the best things about being the Controller of CBeebies is when someone presents me with an idea and I think, ‘Yes!’ That is exactly what CBeebies needs. That’s how it was with Get Well Soon. When Dr Ranj first came to talk about Get Well Soon he gave a great presentation - complete with puppet! I instantly felt he was someone who really understood how to put children and parents at ease when discussing challenging, embarrassing and sometimes scary issues. Being a parent, the idea really struck a chord with me. I kept thinking if only I had had access to a programme like that when my two sons were little, it would have alleviated a lot of the worry and anxiety I faced as an inexperienced parent trying to explain things properly and without scaring them. I really hope Get Well Soon will be the equivalent of a child health book on TV and online. I’m really proud of the way we’ve managed to make Get Well Soon fun and engaging, and informative. We’ve tackled some potentially tricky subjects but they’re all approached sensitively, with a good dose of humour and some great songs! I think a lot of that is down to Dr Ranj - together with Nurse Morag and her Healthy Helpers. Dr Ranj does a great job of explaining things honestly and with empathy, as well as singing and interacting with our youngest audience brilliantly. 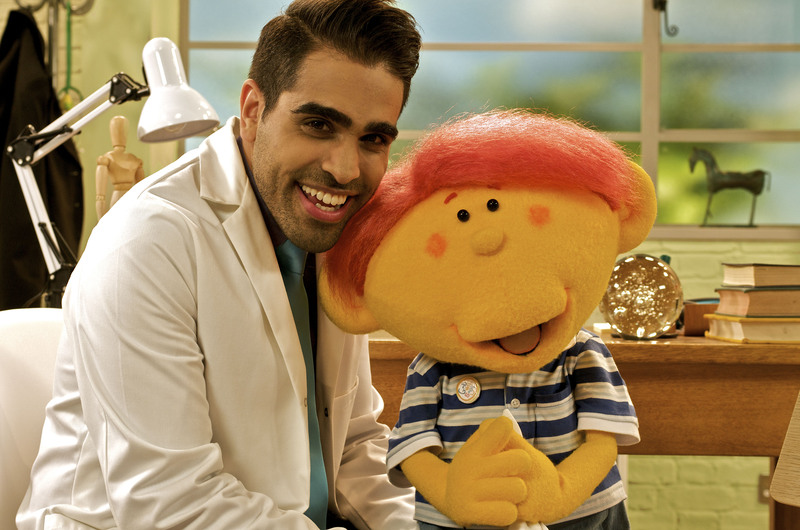 So without further ado, I’d like to hand you over to CBeebies’ doctor in the house - Dr Ranj! Hello Dr Ranj! Are you a real doctor? Yes! Actually, a lot of people seem to be asking me that at the moment! Tell us about Get Well Soon, what's it all about? safe and stimulating environment full of music, laughter and games. What kind of conditions do you cover in the series? and I am extremely proud of. How did you manage to make being ill a fun subject? How did being a TV doctor compare to being a real doctor? puppeteers) on 'Get Well Soon' is something that I will always cherish. Do you have a favourite episode? Any funny moments during filming? find it useful in real life. you could give parents to help their kids stay healthy? 'being healthy' is relevant to them and it will make it fun rather than a chore. And lead by example - your kids will follow what you do and do as you say, so make sure you're looking after yourself too! My 2 year old loves this programme, and we often play doctors after watching an episode - our little Cloudbabies figures seem to always fall on their head and have to visit Dr Ranj and nurse Morag (2 little people characters that look vaguely like them). Great fun and a great addition to the Cbeebies line-up. I hope we get another season. My son (3 and a half) loves this programme SO MUCH! We've recorded the episodes and he wants to watch them over and over. He's learned so much from it, and would like nothing more than for his friends Kiwa, Jobi, Riz, Petal, and Deep to come round and play! My children (3 and 7) years old are great fans of Dr Ranj. They are learning a lot of healthy living skills from your programs. Well done! I have promised them that I will try find out if it is possible to visit Dr Ranj at BBC studios. Is this possible at all? What is the procedure? Thank you once again and well done for your recent Christmas Panto program. quick question, I have been searching the songs without success looking for the words to Nurse Morags healthy Helpers song.................can you help? My son who is two and daughter aged six very much enjoy watching Get Well Soon. They love the songs and find it easy to follow the programme. It's a great show and helps my children feel more comfortable to speak and feel relaxed with their own doctor. Well done on the show! Well done Dr Ranj. My daughter Ruby was diagnosed with type 1 diabetes 2 years ago at the age of 4. Her younger sister watched the diabetes episode and we also recorded it for Ruby. We all thought the programme was excellent, it was also 100% factually correct although it would have been good to have an explanation between the differences of type 1 and type2. Keep up the good work, great dancing too, I'm sure you'll be involved in tv work for many years to come. The CBeebies Grown-ups blog is a unique meeting point between parents and the decision makers at CBeebies. It's here that you'll see exclusive news, information and updates about CBeebies first. To leave a comment on the blog you'll need to log in or register with BBC ID. You can stay up to date with CBeebies Grown-ups via these feeds.